But to tell you the truth, I’m not sure whether I’m supposed to be impressed or disappointed. Not with my girlfriend’s gift-giving choices, mind you! But with Nintendo’s own design regarding the system. I originally had the basic 3DS which I’ve been happy with for quite a while, but recently the L and R buttons mysteeeeeriously stopped working. I’ve tried every possible fix to get it to work, even coming across one that says I have to literally put the 3DS in my mouth as far as it can go and blow on the L and R button REALLY hard. I’m serious, blowing it without sticking the machine all the way into your mouth didn’t work, and these were the exact instructions. I was skeptical at first, but being as desperate as I was I tried it. And you know what? It actually worked. At least for the first few months. Recently, it just didn’t cut it, with the L and R buttons losing contact every five minutes after blowing on them. 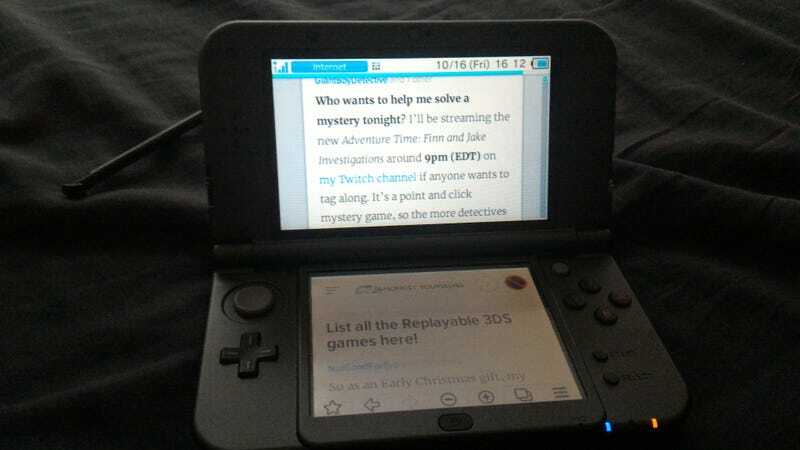 So the New 3DS as a gift was definitely a surprise for me. But opening the box, I found the whole thing to be... flimsy. And I mean, really flimsy. I was so delicately pulling the screen open that I was afraid the hinges would snap in two if I made a loud noise, and the left analogue slider felt like it it would live up to its name too well, so much so that it would just slide right off the system. And don’t get me started on the absolutely nightmarish System Transfer, upon which I wasted 10 hours of my life trying to get it to work. I could still hear my heart beating really loudly every time I open the screen and push the analogue stick in any direction, but so far, the trouble’s been worth it. The screen is actually fantastic, and though in games like Resident Evil: The Mercenaries and Revelations have notable artifacts popping up as a result of upscaled resolution, they look really great. And the 3D is actually top notch! I tried the system’s 3D before in the store, but both the camera and the screen were covered in some little kid’s mucus so I wasn’t sure whether the system didn’t work or if the 3D was just overhyped. The screen just didn’t seem to project anything in 3D at all as opposed to my dinky ol’ 3DS, but I’m happy to say that the New 3DS I got works better than fine. And that analogue nub! That sweet, simple little analogue nub! It isn’t perfect, but I’m legitimately surprised Nintendo still opted for the slider instead of the technology used in the C-Stick, because the moment I pressed my hand on it it felt like it’ll stay there for years without falling off. I guess they had their reasons, since it needs a tad more strength to use, but as a lefty, playing Kid Icarus: Uprising was a dream with it. Speaking of which, get that game. I mean it. Also on the subject of games, that’s where I hit a brick wall. While the 3DS has no shortage of video games as opposed to the Vita, I noticed something strange about the library. In the lengthy time it has been around, apart from the ones that I still have in my installed or in my possession, none of the games I played on the system so far were replayable. Or portable, for that matter. Barring the games I already have in my collection, all the games on the system seem to demand you sit through a full playthrough, and the only replay value comes from starting the game all over again once you finish it, which is in stark contrast to my Vita in which all my games allow me to replay whatever I want, whenever I want, however I want, and as many times as I want, whether I finish the game or not. So far, the only games in my collection that give me permission to do this in my 3DS collection is is Street Fighter (obviously), Resident Evil: Mercenaries (not Revelations, due to it suffering from what I like to call “MMO Syndrome”), and Kid Icarus: Uprising for its many, many game-changing loots. So I kinda need your help. I need to build up my collection of replayable, portable games for it. The replayability I’m looking for needs just one of these three things. Either randomly generated dungeons or the ability to replay levels, but with a different approach available (For example: Kid Icarus: Uprising changes a lot depending on your loadout in otherwise fixed levels). Games with good core mechanics that will still be fun even after you beat it (One of the reasons I keep coming back to Resident Evil: Mercenaries is that the combat is just so gosh-darn fun). Something I can jump into at my own will, play as much as I want, then leave. I heard that this game features a randomly generated, solo and co-operative “tower” mode where you climb up and see how far you can go. Sounds like my jam! But I heard that it was so geared towards co-op that single player is impossible, and with the short campaign it doesn’t look like it’ll have much of an offering for when I play on the go. Bummer. Can anybody confirm this? Seriously, where the crap is this game? I need it in my life, and I especially need one with the survival mode that I always wanted to try. You can’t really go wrong with Mario Kart, and though I don’t have it on the Wii U, I feel like I should be getting it for that, anyway. I could use a good, arcadey racing game on the 3DS, one that tones down the realism and jacks up the insanity. On that note, how great would a Burnout game on the 3DS be? /drools. Duh. But I already have the third one on both my 3DS and the Wii U (for transferring data and whatnot) both digitally installed,. Although lately, it feels... hollow, playing that. Namely because I have this game for the Wii U already, but also because the whole game seems to be entirely built around the multiplayer. Subspace Emissary or at least Melee’s Adventure mode are entirely missing from this entry, and yes, I heard the reasoning behind it, no I don’t buy it as a legitimate excuse. Because of this, I barely play Smash Bros as it is, with the exception of when I get the occasional itch, or when friends come over, which is about the only time this game really gives me my money’s worth. Also, I already have a really flimsy analogue stick by virtue of Nintendo’s track record of easily damageable hardware. I’m pretty sure this will break it. I loved Personas 3 and 4 with a passion. In fact, one of the reasons I loved them were at least in part thanks to the random dungeon generator (don’t hit me!) Sure, it wasn’t that great of a generator, but it made it really easy to stomach sitting through a game the second and third times just to see what other Social Links I can find. Anyway, between the lack of random dungeons Social Links altogether, Persona Q just doesn’t offer what I’m looking for in the series. I know, that doesn’t make me a “true Persona fan,” and I guess I’m not, but random dungeons and Social Links are the reason I got into the series in the first place, and if both are entirely removed in all the other entries, I don’t imagine I’ll enjoy it nearly as much as previous entries, especially when the story is reportedly mere fanfiction in Q. Look, I know they’re amazing and incredible and thought provoking and full of content, but I seriously just can’t get past the fact that you’re basically fighting static images. It feels weird not being able to see your team in action, and it feels even weirder that the enemy doesn’t move at all. This was certainly totally okay back in the good ol’ days, but after getting exposed to Pokemon X and Y and seeing them transition to full-fledged 3D, it just... it feels wrong no matter how many times I try to bring myself to play it. Hopefully, Shin Megami Tensei 4 Final changes that. Not the combat system or anything, fans of the series, just the ability to actually see all the characters actually... do something. Like in Nocturne. So, does anybody have any recommendations?